After photographing Vernon St. in Malden, I grabbed some lunch at a sandwich shop and headed for my motel. The Best Western Terrace Inn is at 1650 Commonwealth Avenue and about two minutes from the trolley stop. I unpacked my suitcase and reviewed my map. Somewhere in the back of my mind, Forest Hills clicked - it is the name of a subway stop on the MTA! I looked on the map and found it to the south of town. I had about two hours before I had to return the rental car, so I plotted out a course. I found the subway stop OK but the cemetery was harder to get to. 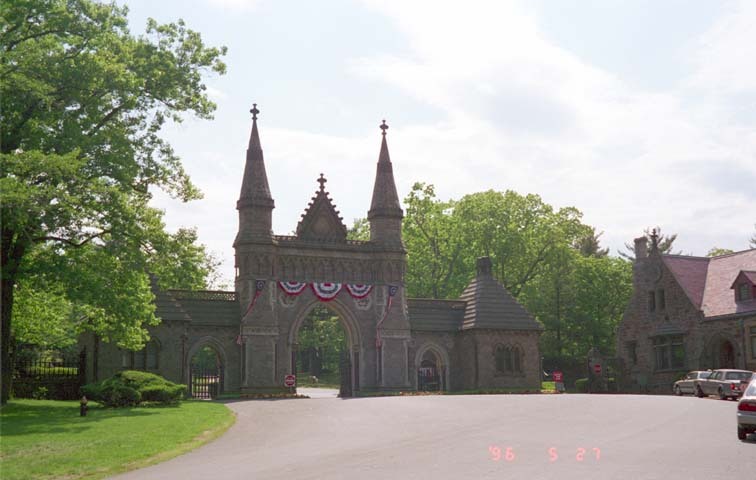 After a couple of misses, I head down Forest Hills Avenue and find the gate shown here. I knew I was in the right place because I had a photo from 1904, shown below. 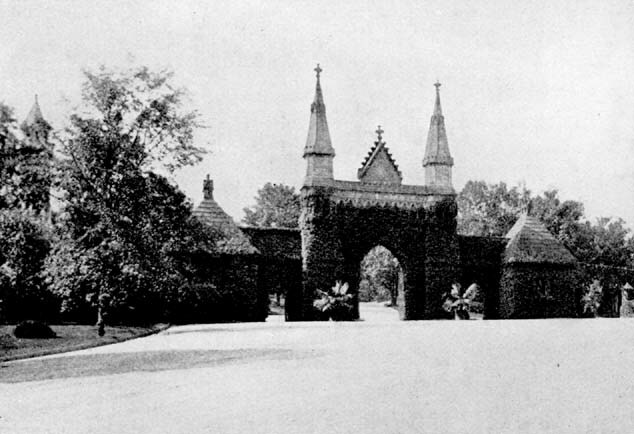 The entrance to Forest Hills, Boston, from Alice Hodgman's 1904 "A Souvenir Of Our Trip"
To the right in the first photograph is the office. It was Memorial Day and Forest Hills was open! I went to the desk and told a clerk the names I was looking for. In about a minute she handed me a copy of a map of the Scales plot and a map of the cemetery. 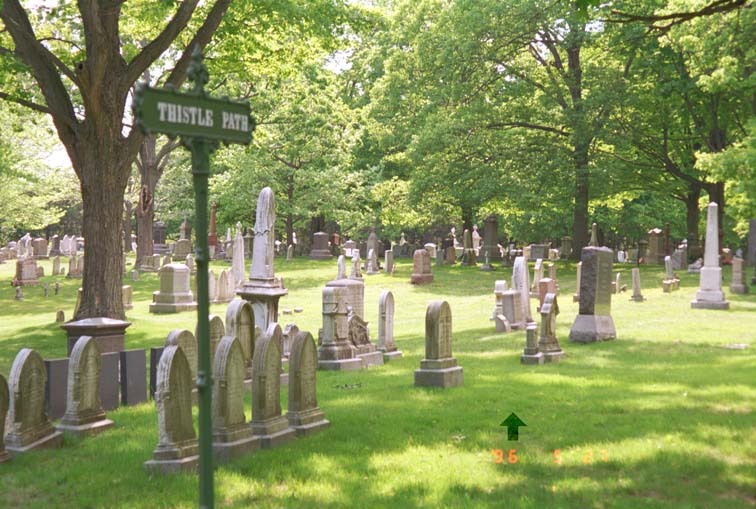 Forest Hills is a city of about 90,000 dead and is organized into roads and paths. I drove and walked and soon I was at Thistle path, where Alice Hodgman told she had lunch in 1904. The Scales plot is above the arrow on this photograph. 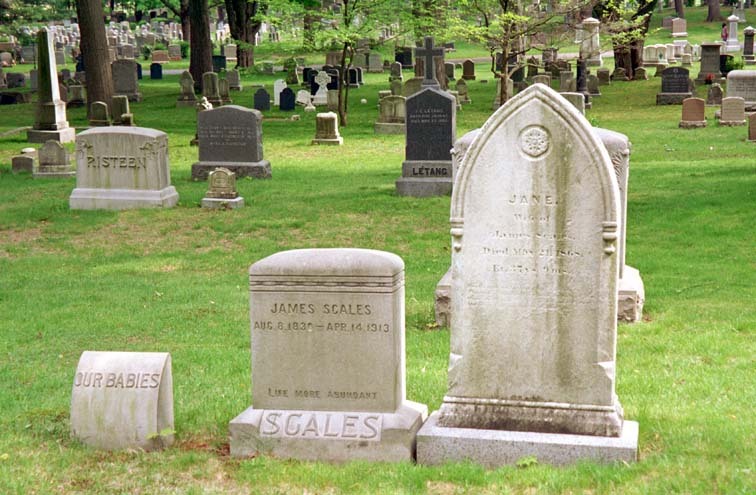 There are three stones in the Scales plot - Our Babies, James Scales, and Jane Jameson Scales.